Texpick Industries Ltd., Nominal 10x100 Taka. 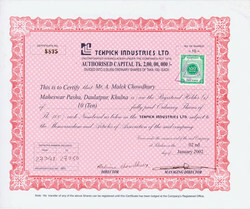 2 January 2002, 10...mehr Texpick Industries Ltd., Nominal 10x100 Taka. 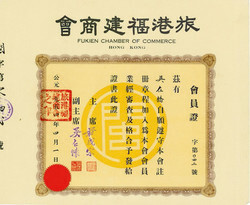 2 January 2002, 10 Ordinary Shares of 100 Taka, #8895, 21.2 x 25.3 cm, red, black, revenue stamp. 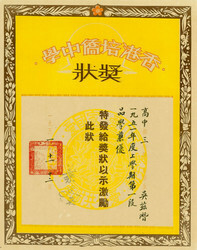 Certificate, 38.9 x 31 cm, brown, ochre, red, black, text only in Chinese. Chinese Government 23rd Year (1934) 6 % Sterling Indemnity...mehr Chinese Government 23rd Year (1934) 6 % Sterling Indemnity Loan (British Boxer Indemnity, Kuhlmann 850), Nominal £ 50. 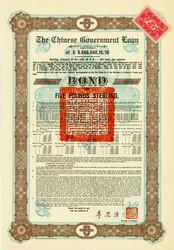 1 June 1934, 6 % Sterling Indemnity Loan for £ 50, #1310, 35.8 x 25.7 cm, brown, green, black, some coupons remaining, small hole at upper left corner, vignette of Dr. Sun Yat-Sen, only 2,000 bonds issued. Chinese Government (Skoda Loan II, Kuhlmann 705 J), Nominal £...mehr Chinese Government (Skoda Loan II, Kuhlmann 705 J), Nominal £ 1.000. 30 September 1925, 8 % Bond for £ 1,000, #26747, 38.2 x 26.2 cm, turquoise, red, brown, 19 coupons, minor horizontal fold, sticker "£1.000". R7. 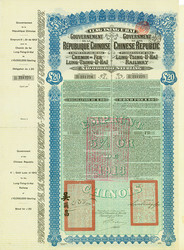 République Chinoise - Chemin de Fer Lung-Tsing-U-Hai (Kuhlmann 282),...mehr République Chinoise - Chemin de Fer Lung-Tsing-U-Hai (Kuhlmann 282), Nominal £ 20. Chinese Government 23rd Year (1934) 6 % Sterling Indemnity...mehr Chinese Government 23rd Year (1934) 6 % Sterling Indemnity Loan (British Boxer Indemnity, Kuhlmann 851), Nominal £ 100. 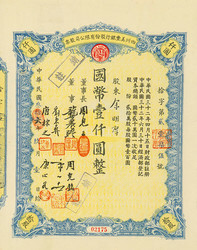 1 June 1934, 6 % Sterling Indemnity Loan for £ 100, #4612, 35.8 x 25.7 cm, blue, brown, green, black, some coupons remaining, small pinholes, vignette of Dr. Sun Yat-Sen, only 4,000 bonds issued. 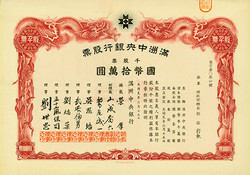 Hong Kong, Certificate, 33.7 x 40.8 cm, brown, black, ochre, red. 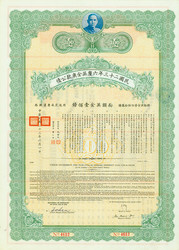 Central Bank of Manchuria / Manzhou Zhongyang Yinhang, Nominal 1.000...mehr Central Bank of Manchuria / Manzhou Zhongyang Yinhang, Nominal 1.000 Shares. 1932, 1,000 Shares, 21 x 29.7 cm, #4, red, black, superb, text in Chinese, superb: building in underprint, two dragons in the border, R9. Berlin, 1...mehr Schantung-Eisenbahn-Gesellschaft, Nominal 1.000 Mark. 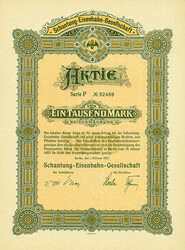 Berlin, 1 February 1923, Share of 1,000 Mark, Series P, #92469, 35.8 x 26.2 cm, orange, black, some coupons remaining. 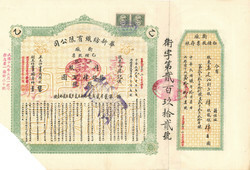 Republic of China [4 Stück], Nominal 1 / 10 / 50 / 100 Yuan. For...mehr Republic of China [4 Stück], Nominal 1 / 10 / 50 / 100 Yuan. 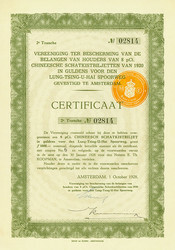 Vereeniging ter Bescherming van de Belangen van Houders van 8...mehr Vereeniging ter Bescherming van de Belangen van Houders van 8 % Chineesche Schatkistbiljetten van 1920 in Guldens voor den Lung-Tsing-U-Hai Spoorweg (Kuhlmann 760 B), Nominal 1.000 Gulden. 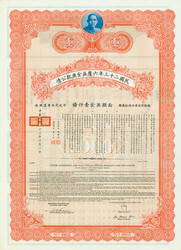 Shanghai Chinese Electric Co. Ltd., Nominal 10.000 x 10 Yuan. 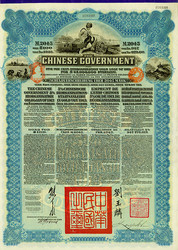 1947,...mehr Shanghai Chinese Electric Co. Ltd., Nominal 10.000 x 10 Yuan. Société Anonyme Miniére des Aimaks de Touchetoukhan et...mehr Société Anonyme Miniére des Aimaks de Touchetoukhan et de Tsetsenkhan en Mongolie (АО рудного дела Тушетухановского и Цеценхановского Аймаков в Монголии), Nominal 5 x 50 Rubel. 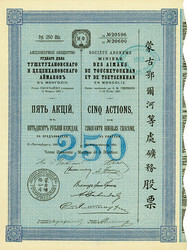 St. Petersburg, 1911, Share of 5 x 50 Rouble, #20596-600, 32.7 x 24.2 cm, blue, black, some coupons remaining, text in three languages: Russian, French, Chinese or Mongolian, scalloped edge at right, Goryanov 3.40.2. 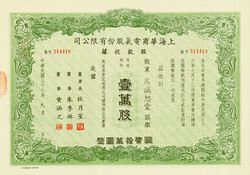 Mei Feng Bank of Szechuen, Nominal 10 x 1.000 Yuan. 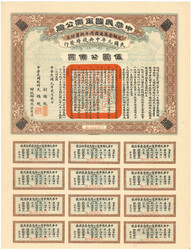 1947, 10 Shares...mehr Mei Feng Bank of Szechuen, Nominal 10 x 1.000 Yuan. 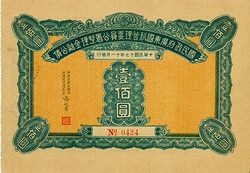 1947, 10 Shares á 1,000 Yuan, #2175, 30.2 x 25.7 cm, blue, ochre, black, some coupons remaining. Chinese Government (Kuhlmann 301), Nominal £ 100 = 2.045 Mark =...mehr Chinese Government (Kuhlmann 301), Nominal £ 100 = 2.045 Mark = 2.525 Francs = 947 Rubel. Chinese Government 23rd Year (1934) 6 % Sterling Indemnity...mehr Chinese Government 23rd Year (1934) 6 % Sterling Indemnity Loan (British Boxer Indemnity, Kuhlmann 852), Nominal £ 1.000. 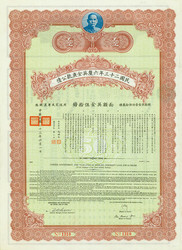 Chinese Government (Skoda Loan II, Kuhlmann 700 C), Nominal £ 5. 30...mehr Chinese Government (Skoda Loan II, Kuhlmann 700 C), Nominal £ 5. 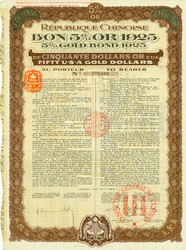 30 September 1925, 8 % Bond of £ 5, #1015, 38.4 x 26.3 cm, turquoise, red, brown, sticker "£5", 5 coupons, 4 pages. 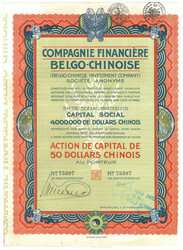 République Chinoise (Kuhlmann 670) [5 Stück], Nominal US-$ 50. Lot...mehr République Chinoise (Kuhlmann 670) [5 Stück], Nominal US-$ 50. 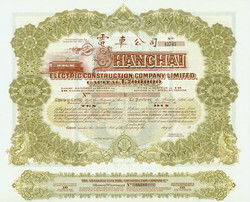 Shanghai Electric Construction Company Limited, Nominal 10 x £...mehr Shanghai Electric Construction Company Limited, Nominal 10 x £ 1. 19__ (ca. 1936), Unissued Certificate for 10 Shares á £ 1, #A1743, 24.5 x 37 cm, ochre, red-brown, rest of coupons, bilingual: French, English, vignette with a tramway. The company supplied shanghai with electricity and operated the tramway in Shanghai. Chinese Government (Kuhlmann 304), Nominal 2.045 Mark = £ 100= 2.525...mehr Chinese Government (Kuhlmann 304), Nominal 2.045 Mark = £ 100= 2.525 Francs = 947 Rubel = 979,60 Yen. 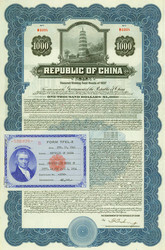 Republic of China (Kuhlmann 952), Nominal US-$ 1.000. 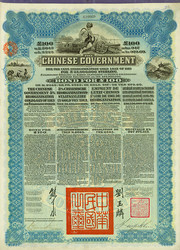 New York, 1...mehr Republic of China (Kuhlmann 952), Nominal US-$ 1.000. 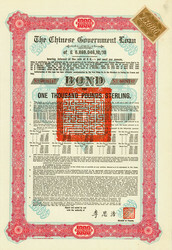 New York, 1 July 1937, 2-4 % Secured Sinking Fund Bonds of 1937 for US-$ 1,000, #M4098, 38.2 x 25.8 cm, blue, black, some coupons remaining, Form TFEL-2 attached, vignette with pagoda. R8.